Assistant Professor Michael Waring, PhD (PI) and Associate Professor Jin Wen (co-PI) are recent recipients of a National Science Foundation (NSF) award titled “Intelligent Multi-Criteria Building Ventilation Control within Dynamic Urban Environments,” in the amount of $299,666 over three years. Poor indoor air quality (IAQ) substantially impacts human health and productivity especially given that people spend the majority of their time indoors. Acceptable indoor air quality requires ventilation. Commercial buildings set their ventilation standards at the minimum requirements in order to save cost and prolong wear and tear on the system. Efforts to increase ventilation can also strain the energy grid and increase poor air quality in urban areas. The goal of this project is to develop a new framework that revaluates the current minimum ventilation requirements with the intent to promote environmental sustainability, increase occupant wellbeing, improve energy efficiency, and reduce greenhouse gas and local pollutant emissions. Investigators will research the next-generation of intelligent ventilation strategies for high performance green buildings. Jin Wen, PhD, an associate professor in the College of Engineering and co-director of the Building Science & Engineering Group, is developing a powerful tool that can analyze the big data generated by various components in building control systems—thermostats, air and water flow sensors, and energy meters for example—alert building operators when there is a problem, which is often difficult to notice without assistance, and suggest options for fixing it. Drexel University MS student Jesse Schwakoff was presented a scholarship sponsored by ASHRAE at the monthly Philadelphia Chapter ASHRAE meeting. Jesse was one of three individuals from local colleges selected for the award. This scholarship is presented to recognize individuals who have excelled in their studies and who demonstrate a strong interest in HVAC. Steve Snyder is currently a part-time student pursing a Ph.D. in Architectural Engineering at Drexel University. His research is focused on the calibration of whole building energy simulation models to actual building performance data. During the day Steve works as an energy services / smart building technology engineer for Johnson Controls. His primary job responsibilities include: energy engineering consulting, technical energy assessments of large commercial buildings (including laboratories, data centers, low- and high-rise office buildings, etc. ), retro-commissioning, calibrated energy simulation, and remote analytical services (e.g., monitoring based-commissioning, fault detection and diagnostics, etc.). Steve is a Certified Energy Manager with the Association of Energy Engineers. Steve graduated from Arizona State University in 2011 with a M.S. in the Built Environment. His masters research involved tracer-gas based calibration of multi-zone air flow simulation models. Prior to joining ASU, Steve worked as an HVAC design engineer-in-training at the architectural engineering firm EwingCole in Philadelphia, PA. Steve received a B.S. in Architectural Engineering from Drexel University in 2008. Snyder, S., T.A. Reddy, and M.S. Addison. 2013. Automated Design of Buildings: Need, Conceptual Approach, and Illustrative Example. Proceedings of the 2013 ASHRAE Winter Conference, Dallas, TX. Snyder, S., T.A. Reddy, and W. Bahnfleth. 2012. Investigation of CO2 Tracer Gas-Based Calibration of Multi-Zone Airflow Models. ASHRAE Transactions 118(2). Snyder, S., T.A. Reddy, and W. Bahnfleth. 2011. Investigation of CO2 Tracer Gas-Based Calibration of Multi-Zone Airflow Models. Proceedings of the 12th International Conference on Indoor Air Quality and Climate, Austin, TX. Reddy, T.A., S. Snyder, J. Bem, and W. Bahnfleth. 2011. Analysis Tools and Guidance Documents for Evaluating and Reducing Vulnerability of Buildings to Airborne Threats – Part 1: Literature Review. ASHRAE Transactions 117(1). Reddy, T.A., S. Snyder, J. Bem, and W. Bahnfleth. 2011. Analysis Tools and Guidance Documents for Evaluating and Reducing Vulnerability of Buildings to Airborne Threats – Part 2: Comparison of Tools. ASHRAE Transactions 117(1). Andersen, Zorana Jovanovic, Frederiksen, Marie, Gunnarsen, Lars, Karottki, Dorina Gabriela, Loft, Steffen, Madsen, Anne Mette, Massling, Andreas, Moller, Peter, Michal Spilak (2015). Indoor and Outdoor Exposure to Ultrafine, Fine and Microbiologically Derived Particulate Matter Related to Cardiovascular and Respiratory Effects in Panel of Elderly Urban Citizens. International Journal of Environmental Research and Public Health, 2015. 12: 1667-1686. Li, X. and Wen, J. (2015) Comparison of On-line Building Energy Forecasting Model Using System Identification Method and Other Methods, ASHRAE Summer Conference, Atlanta, GA, June 27- July 1, 2015. Stephens, B., Adams, R.I., Bhanger, S. Bibby, K., Waring, M.S. (2015). Editorial: From commensalism to mutualism: Integrating the microbial ecology, building science, and indoor air communities to advance research on the indoor microbiome. Indoor Air, 2015. 25: 1-3. Jesse Schwakoff is an M.S. student in the field of architectural engineering at Drexel University. His current research is in the area of automated fault detection and diagnosis (AFDD) for building HVAC systems. Within this field, he is especially focusing on active diagnostics in detecting faults. Jesse received a B.S. in Meteorology (2011) from Pennsylvania State University and went on to work as a private sector meteorologist for 2 years before deciding to make the switch into the engineering field. 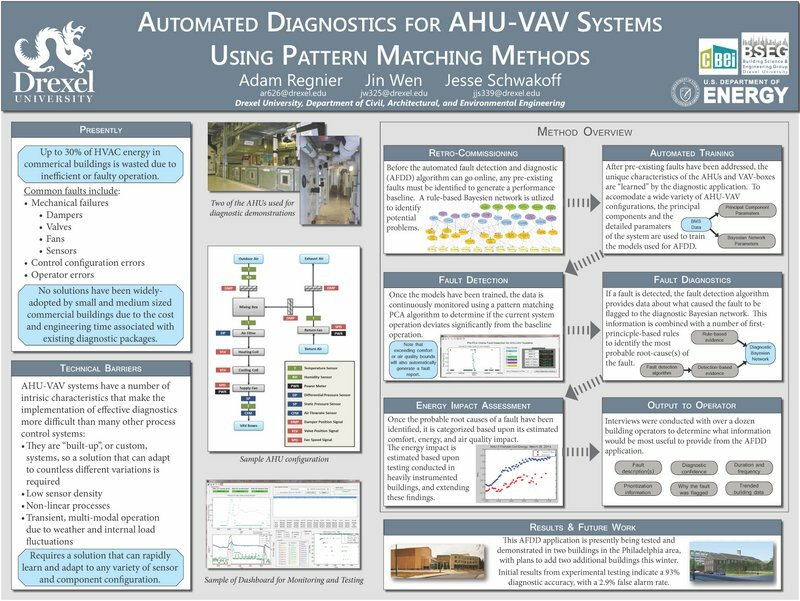 Drexel University PhD candidate Adam Regnier was awarded “Best Demo” at the 2014 ACM BuildSys Conference, for his demonstration titled Automated Diagnostics for AHU-VAV Systems Using Pattern Matching. The conference focuses on embedded systems for energy-efficient buildings, and Adam’s work demonstrated a novel, low-cost method to automatically detect and diagnose faults in HVAC systems. This diagnostic tool was demonstrated with an interactive user interface that had been previously deployed to perform real-time diagnostics at a commercial building in the Philadelphia Naval Yard. His project has been performed in conjunction with his advisor, Dr. Jin Wen, and funded by the Department of Energy as part of the Consortium for Building Energy Innovation. Watch Jared’s defense presentation here! The thesis is titled “Human Behavior and Low Energy Architecture: Linking Environmental Adaptation, Personal Comfort, and Energy Use in the Built Environment”. An abstract can be found here. El Orch, Z., Stephens, B., Waring, M.S. (2014). Predicting indoor particles of outdoor origin in single-family residences in the U.S. Building and Environment, 2014. 74: p. 106-118. Langevin, J., Wen, J., & Gurian, P.L. (2014). Simulating the human-building interaction: Development and validation of an agent-based model of office occupant behaviours. Paper presented at Windsor 2014, Windsor Great Park, UK. Li, X., & Wen, J. (2014). Review of Building Energy Modeling for Building Control and Operation, Renewable & Sustainable Energy Reviews, 2014. 37: p. 517-537. Li, X., & Wen, J. (2014). Building Energy Consumption On-line Forecasting Using Physics Based System Identification, Energy and Buildings, 2014. 82: p. 1-12. Li, X., Wen, J. & Wu, T. (2014) Net-Zero Energy Impact Building Clusters Emulator for Operation Strategies Assessment, Paper presented at the ASHRAE 2014 Annual conference; Jun. 2014, Seattle, WA, USA. Li, X., & Wen, J. System Identification for Building Energy Estimation, Paper presented at the IEEE International Conference on Automation Science and Engineering (CASE 2014), Aug. 2014 Taipei, Taiwan. Li, X., & Wen, J. Building Energy Consumption On-line Forecasting Using System Identification and Data Fusion, Paper presented at the ASME 2014 Dynamic Systems and Control (DSC) Conference, Oct. 2014, San Antonio, Texas, USA. Liu, R., Wen, J., Waring, M.S. (2014). Improving airflow measurement accuracy in VAV terminal units using flow conditioners. Building and Environment, 2014. 71: p. 81-94. Rackes, A., Waring, M.S. (2014). Using multiobjective optimizations to discover dynamic building ventilation strategies that can improve indoor air quality and reduce energy use. Energy and Buildings, 2014. 75: p. 272-280. Regnier, A., & Wen, J. (2014). Automated Fault Detection and Diagnosis for AHU-VAV Systems: A Pattern Matching Approach. Paper presented at the ASHRAE Winter Conference in New York City in January 2014. Russell, J. Hu, Y. Chau, L. Pauliushchyk, M., Anastopoulos, I., Anandan, S., Waring, M.S. (2014). Indoor biofilter growth and exposure to airborne chemicals induce similar changes in the root bacterial communities of plants. Applied and Environmental Microbiology, 2014. AEM-00595. Wang, C. , Waring, M.S. (2014) Indoor secondary organic aerosol formation initiated from reactions between ozone and surface-sorbed squalene. Atmospheric Environment, 2014. 84: p. 222-229. Waring, M.S. (2014). Secondary organic aerosol in residences: predicting fraction of fine particle mass and determinants of formation strength. Indoor Air, 2014. 24: p. 376-389. Waring, M.S., Wells, J.R. (2014). Volatile organic compound conversion by ozone, hydroxyl radicals, and nitrate radicals in residential indoor air: Magnitudes and impacts of oxidant sources. Atmospheric Environment, special edition on Indoor Air, published early online. Wen, J. & Regnier, A. (2014) Chapter 38: AHU AFDD. In B. Capehart & M. Brambley (Eds. ), Automated Diagnostics and Analytics for Buildings (1st ed., pp. 467-489). Lilburn, GA: The Fairmount Press. Youssefi, S., Waring, M.S. (2014). Transient secondary organic aerosol formation from limonene ozonolysis in indoor environments: Impacts of air exchange rates and initial concentration ratios. Environmental Science and Technology, 2014. 48: p. 7899-7908.